Range of Nitrile gloves for food preparation, cleaning & hygiene, process working, materials handling and maintenance tasks. Allergy free. 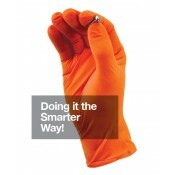 The Glove Company Work Gear Orange Nitrile Gloves - Small - box-100***Only one box left***The world’..